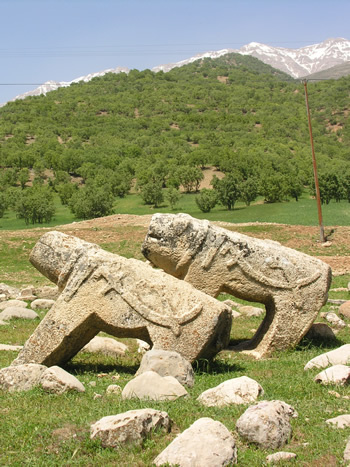 Stone lions are the traditional grave-markers for the bravest of Bakhtiari warriors – these are in Chahar Mahal, at the western end of the migration, with the mountains we have walked over behind us. As we came towards the end of the migration, everyone was getting tired. 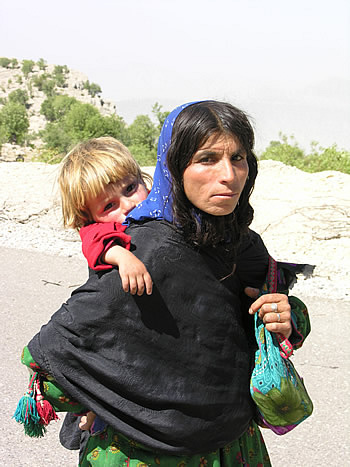 Blonde children are surprisingly common among the Bakhtiari, and this little one stood no chance of keeping up with his mum if she didn’t carry him – I had to run alongside to take this photo. 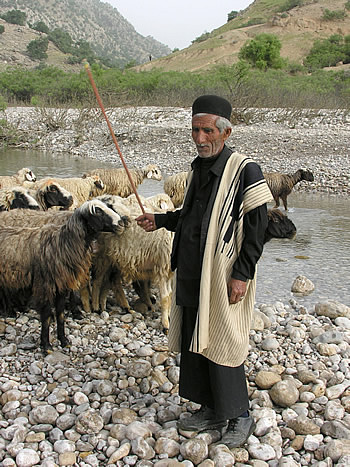 The Bakhtiari traditionally tied inflated goatskins to animals and people to help them over the largest rivers. Now, some bridges have been built, although we still walked through the shallower waters. 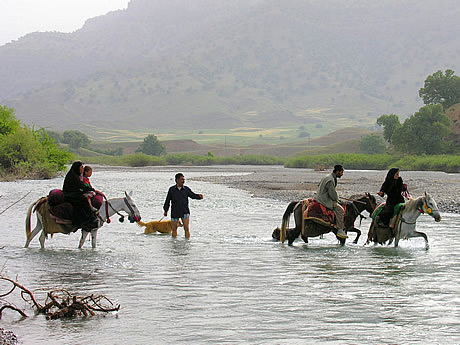 Between the Zagros mountain ranges are riverine areas. Here, Terasi is helping part of the flock cross a small stream. 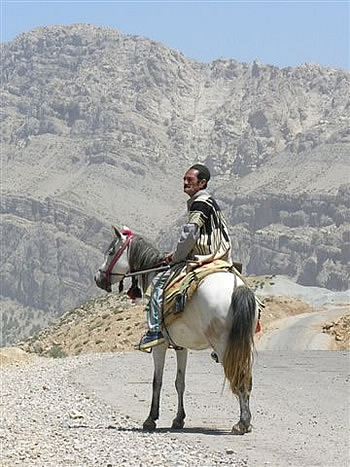 The Zagros consist of parallel ranges of mountains about as high as the Alps. You have to walk right up and then right down all of them on the migration – but that hardly seems to matter, since on the tops it’s like you can see the whole world below and around you. 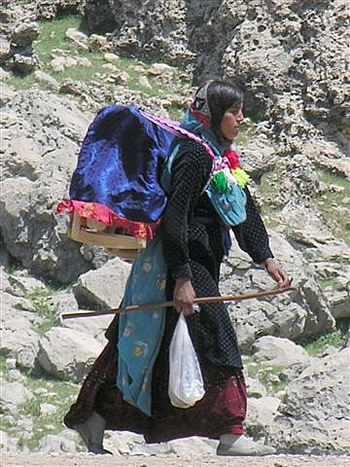 This unmarried woman is walking fast. 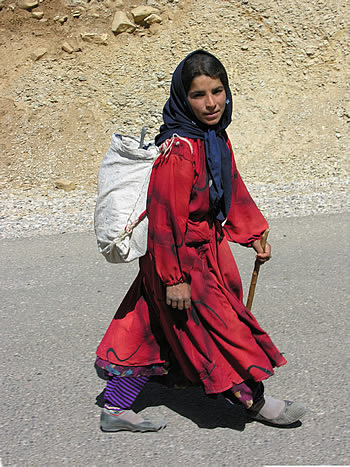 Notice her light plastic shoes – my walking boots were ridiculed as too heavy to be practical. We were in a ‘flock jam’ here. 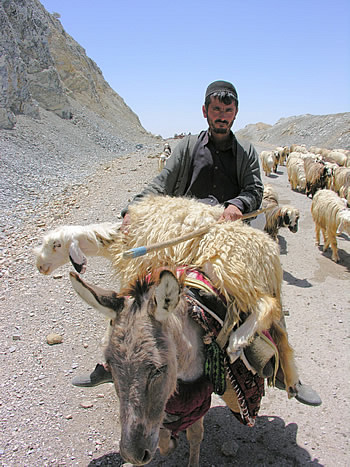 With only one pass over the highest mountains, all the families are forced to converge from their many grazing paths. 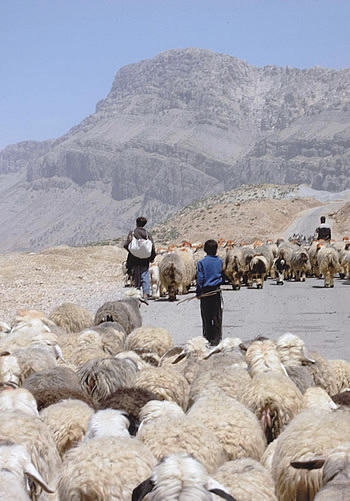 Of course, on a road, the stock can’t feed so everyone tries to move on as fast as possible. 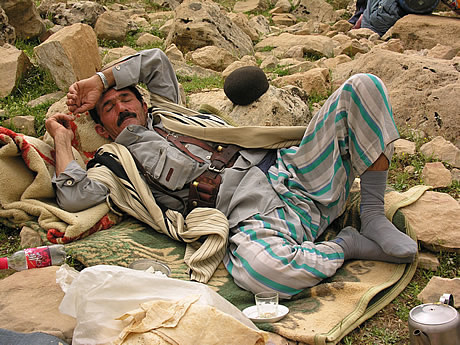 Morteza is relaxing at the midday halt, in his more everyday striped undertrousers. On the migration, we all slept close together on the ground with the herds around us, although we usually found a less rocky place than this for the night. Note Morteza’s cartridge-belt.